High point horse Shy Gayfeen++++// (Safeen x Gayleen RCA) competed in Hunter Pleasure in Regions 3, 6, and 17. Among his top finishes were Hunter Pleasure Championship in Region 6, Reserve Hunter Pleasure AT Championship in Region 17, and top 10 Hunter Pleasure AATR 18-39 at the Canadian Nationals. Shy Gayfeen++++// is a 1998 bay stallion, bred in Canada and owned by Cori Wilson. 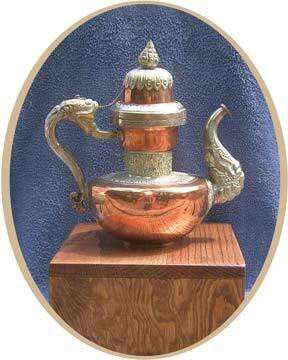 The perpetual trophy awarded to the top horse comes from the estate of Walter Schimanski. Cori will also receive a cash prize donated by Hansi Heck-Melnyk, long-time owner of Serenity Farms and a strong advocate for demonstrating the performance abilities of the Desert Arabian horse. Susar El Khamor (Masada El Rabdan x Om Khamsa). Drinkers Of The Wind Perpetual Trophy from the estate of Walter Schimanski. Four of the top 10 excelled in dressage. 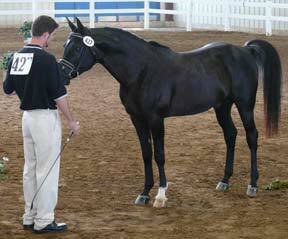 In his first full show season, Khehanad Adhem+, 1999 black stallion, showed in both open and AHA classes in Region 14. He was Reserve Champion Training Level AT for Region 14 and received his Legion of Honor from AHA. He gained a number of USEF awards, including USEF Horse of the Year Champion: Region 14 Amateur First Level and was ranked 7th in the Nation in Amateur Training Level Dressage. Khehanad Adhem+ is owned by Lance Bowman. Another first-year competitor, BW Fadl Tali, 2000 black stallion, showed at Training Level in open classes, finishing first at several Potomac Valley Dressage Association shows that benefit local charities. BW Fadl Tali is owned by Megan Detweiler, who followed Tali’s progress from overseas while serving in the U.S. Army in Iraq and Kuwait. Susar El Khamor, 1996 bay stallion, topped his year taking first in A/HA/AA Second Level at the Texas State Fair, with other points at competitions in Region 9. He is owned by Susan Mayo and Cyann Looney. Mah Sabbah Bedu, 2001 bay stallion, took firsts and seconds at First Level in open and AHA shows, including the Texas State Fair, the Mayfest Challenge, and Cowtown Classic. He is owned by Dr. Keith Kosel and Susan Mayo. 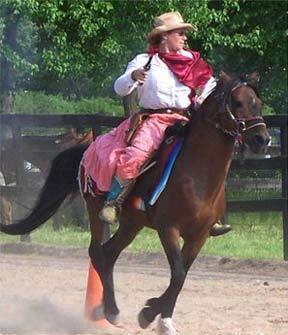 Two geldings were top endurance horses. Crucian, 1995 chestnut, finished top 5 in the Region 13 championships, completing seven 50-mile and two 55-mile rides. He placed first in the Hopkins Creek Ride and third in the FEI-CEI *** Fun In The Sun Pioneer 55-mile ride. He ranked 5th in the AERC Midwest Region Heavyweight Division. Crucian is owned by Michele Dake. DB Dahman, 2000 chestnut, had points in both endurance and hunter pleasure. He completed six AERC-sanctioned 50-mile rides and finished with one first, two 2nds, two 3rds, and four best condition awards. He ranked second in Best Condition for AERC Midwest Region. He is owned by Paula Kaigh. Many of the horses are also shown in Sport Horse. Khehanad Adhem+ with Lance Bowman. Two top ten horses competed exclusively in Western Pleasure classes: Canadian-bred Sigar, 1998 bay gelding and half brother to Shy Gayfeen++++//, showed in Western Pleasure, including AO, AT, and AAO, in Regions 3 and 4, topping his competition year with top 4 in the Region 3 championships. He also was ranked 4th in USEF Western Pleasure Open and 11th Western Pleasure Adult Amateur. He is owned by Emily Vincent. RB Cavalier, 1991 black stallion, showed in Western Pleasure, AO, AT, and AAO classes in Region 9, taking Arabian Western Pleasure AO Championship at the Cowtown Classic. He is owned by Morgan Millner. One other top ten horse had points in multiple disciplines. Ibn Bilal Halima, 2002 grey gelding, had points in both Western and English Pleasure classes and in Trail. He was shown in open shows, including the Wisconsin State Fair and the Great Lakes Morab show. He is owned by Nancy Merkel. The Drinkers of the Wind Performance Award competition is open to horses presumed to descend entirely from Bedouin-bred horses. All horses marked in the AHA DataSource as being Pyramid Society Straight Egyptian and/or Al Khamsa horses in North America are eligible to compete. These top ten horses represent all historic bloodline groups of Desert Arabian heritage. Six are Straight Egyptian (Shy Gayfeen++++//, BW Fadl Tali, Ibn Bilal Halima, Mah Sabbah Bedu, Sigar, Susar El Khamor). One, Khehanad Adhem+, is Egyptian-sired, with Egyptian, Davenport and other early imports in his dam-line. Crucian is of straight Davenport breeding, DB Dahman is from the Blue Star tradition of predominantly Saudi breeding, and RB Cavalier blends Straight Egyptian-*Turfa- Saudi and other bloodlines. Mystic UF with Aida Schreiber. The Institute also recognized top six among horses that competed in local, community, 4-H, and other shows in less-traditional events. SS Istari (1991 black gelding, Egyptian-*Turfa bloodlines) showed in open Dressage, Western Pleasure, and Hunter classes. Mystic UF (1987 bay stallion, straight Davenport) continued his climb in the ranks of mounted shooting horses; he is only the second Arabian to become a certified Champion Shooting Horse in a sport that is growing quickly. Susar El Khameen (2002 chestnut gelding, straight Egyptian) and Susar Jel Rabdan (1993 bay gelding, Egyptian-*Turfa) competed in English, Trail, Jumping, and Pattern classes; Gwaihir TOS (2000 grey stallion, Blue Star) continued to develop as an endurance horse; and Roshan NA (2003 grey gelding, Straight Egyptian) showed in Hunter Pleasure. The Institute recognizes these horses for the role they play in demonstrating the performance capabilities of the Desert Arabian Horse in local and unrated shows and as a way to reward owners for getting their horses out in front of the general public. The Institute for the Desert Arabian Horse is a non-profit, 501 (c)(3) public charity devoted to protecting and conserving the cultural legacy and genetic integrity of the Bedouin-bred Arabian horse through historical and scientific research, education, standard performance evaluations, international collaboration and conservation projects. For further information about the Drinkers of the Wind award program, contact Susan Mayo. Participation is free.